Photo Shoot Pictures of Tamil Nadu Farmers Protesting in Delhi! These are not kingfisher models, but it’s a photo shoot of last year when India Today journos made these farmers pose for the camera. A message doing rounds on social media alleges to show the Photo Shoot Pictures of Tamil Nadu Farmers’ Protest made by India Today journalists. 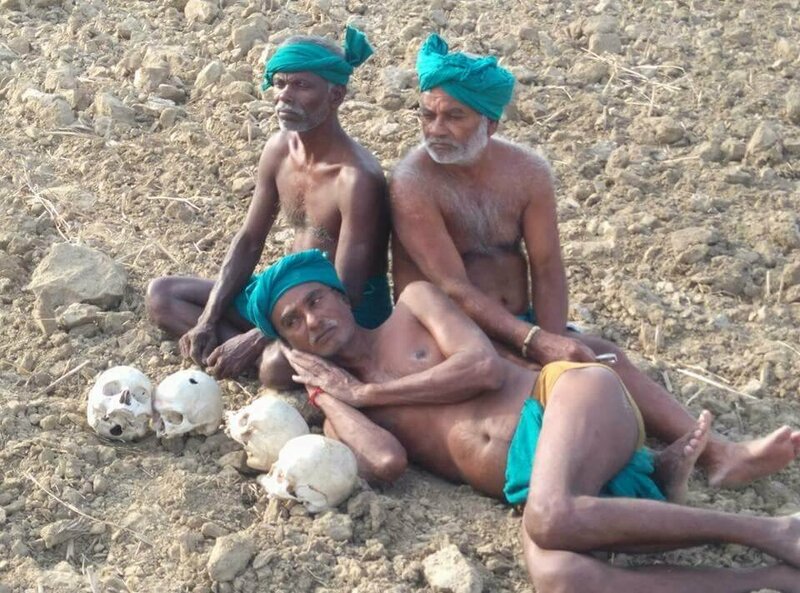 It suggests the journos posed the farmers on barren land with human skulls around them. Yes, the photo shoot incident is a fact. The backdrop and details are explained below in detail. In March and April 2017 around 170 farmers from Tamil Nadu conducted a protest for 41 days at the Jantar Mantar in New Delhi. The Tamil Nadu farmers faced severe drought for two consecutive years and sought relief from the Narendra Modi government. Their demands included a relief package of nearly Rs 40,000 crore, a farm loan waiver, setting up of Cauvery Management Board and inter-linking of rivers. The protest, headed by lawyer and farmer leader, P. Ayyakannu was conducted in quite a different manner and caught wide media attention. The farmers displayed human skulls, allegedly of their colleagues who committed suicide. They shaved their heads and moustaches, cross-dressed as women, ran naked near Prime Minister’s Office, held mouse in their mouth, and even drank urine. During the protest in 2017, a State Secretary of Bhartiya Kisan Union shared the photo shoot pictures of Tamil Nadu farmers on Facebook. He said the Tamil Nadu farmers and India Today magazine team have reached his Chauroli village (in Noida) and conducted the photoshoot for their next week magazine in the village. Columnist SG Suryah also shared few pictures from the photo shoot saying India Today drove the protesting farmers to Chauroli village and had a photo shoot probably for their next issue. The photo shoot of farmers during a sensitive agitation in Capital city shocked viewers. There came up an allegation that one person involved in the protest is not actually a farmer, but Shek Husen, an anti-nationalist. As a matter of fact, Shek Husen was a former manager at Nam Dinamathi, a Tamil Daily newspaper. We saw Shek Husen shared a video related to the farmers protest on Facebook, and some of his posts at the time are deleted. Netizens also showed few pics from the protest suggesting the poor farmers were getting packed food and mineral water bottles from a South Indian restaurant. All these aspects raised questions whether someone else planned the farmers protest in Delhi with some hidden agenda. Indian Prime Minister Narendra Modi did not meet the farmers protesting in Delhi. Officials suggested that Agriculture is a state subject. The Centre, however, released Rs 2014.45 crore from the National Disaster Response Fund (NDRF) as assistance to Tamil Nadu for drought relief and other works. The farmers suspended their agitation after getting assurance from Tamil Nadu Chief Minister E Palaniswami. Later, the Union Cabinet approved a steep rise in the minimum support price (MSP) of crops, giving farmers the promised 50% return on input costs. The step is to ease farm distress and boost rural demand. However, the farmers in Tamil Nadu wanted more and started protest again. In November 2019, All India Kisan Sangharsh Coordination Committee (AIKSCC) organized the protest called Kisan Mukti March to Delhi Parliament. Various opposition parties’ leaders and activists supported the protest, as hundreds and thousands of farmers from different parts of country joined. They demand remunerative prices for their produce, freedom from debt and a special session of Parliament on the agrarian crisis. There are allegations suggesting some NGOs are taking advantage of the agitation, to continue the protest and malign Modi government. Earlier, President of Indian National Congress, Rahul Gandhi also joined the Tamil farmers protesting at Jantar Mantar. He indeed slammed Prime Minister Narendra Modi for neglecting the farmers. The way the protest went on in ingenious ways also hints probability of political agenda. The leader of the farmer protest in 2017, P. Ayyakannu is in fact a political person. He left Bhartiya Kisan Sangh and started his own association for the welfare of farmers. Since BJP came to power, Ayyakannu continued to protest against central government, giving voice to agriculture related problems. There are also allegations that the rich landlord had ulterior motives and tie-ups with other biggies in Tamil Nadu. Agriculture is in fact a big business in Tamil Nadu. And certainly, the drought has affected the farmers to a great extent. But some of the politicians in agriculture business take loans from banks and do not pay back. Note, loan waiver is one demand in protest; the leaders stress on 40,000 crore drought relief from Centre. Earlier in April 2017, the national secretary of the BJP, H. Raja called Ayyakannu a “fraud”. One journalist also questioned the accuracy of the drought figures given by TN government. Some believe the protest is more about arm-twisting center on releasing 39,000 crore as relief fund. Moreover, Tamil Nadu farmers called off their 40 days strike in Capital the same day the elections of Municipal Corporation of Delhi took place on 23 April 2017. Coming back to the story in question, as explained above, the photo shoot pictures of Tamil Nadu farmers’ protest were in fact taken by India Today journalists.